The difference between a classy lady and a hussy? 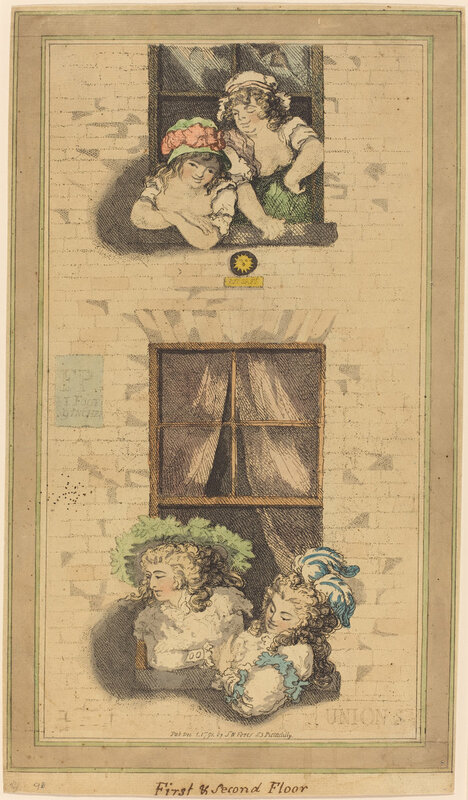 According to Thomas Rowlandson, the first or second floor. 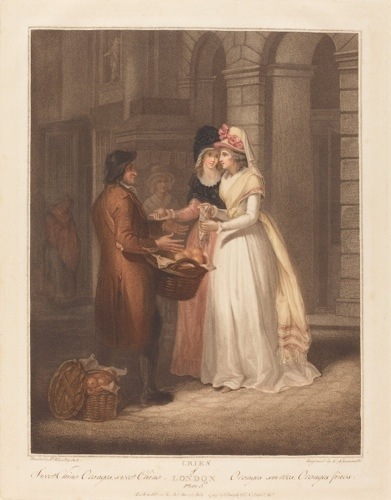 Francis Wheatley’s paintings of London street criers represent the century’s most successful depiction of hawkers, albeit also the most idealized. 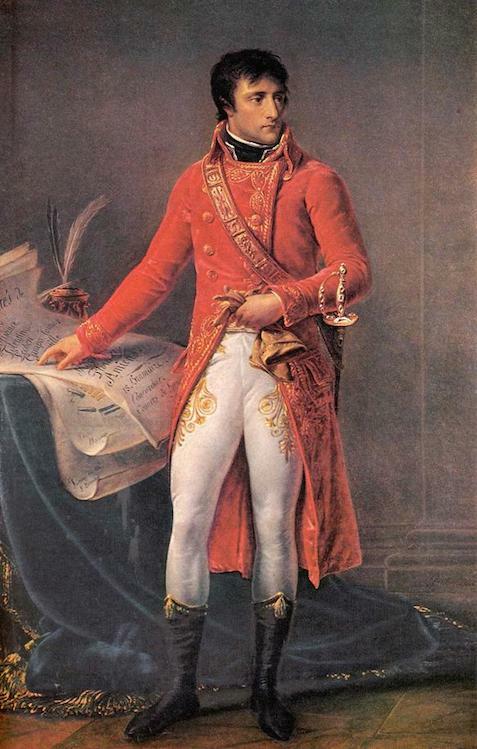 This is not surprising given that they appeared at the Royal Academy from 1792 to 1795 when romantic aesthetics and neoclassical sentiments were reaching their zenith. But I must say they are pleasant enough to look at. A sense of healthfulness pervades. The hawkers are rosy-cheeked and clean, going about their day to day business in a tidy, calm manner. Thankfully, though, for those of us who like variety, Wheatley wasn’t the first to start the trend. The first prints of London criers date from 1600 and enjoyed three decades of popularity. 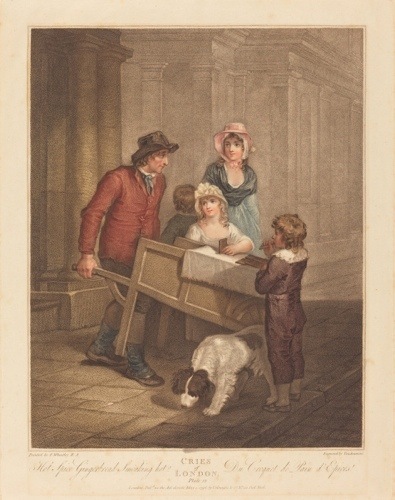 For comparison to Wheatley, take a look at Marcellus Laroon’s “Cryes” first published in 1687; Paul Sandby’s in 1760s; and my favorite, Thomas Rowlandson’s satirical Cries of London, which first appeared in 1799. 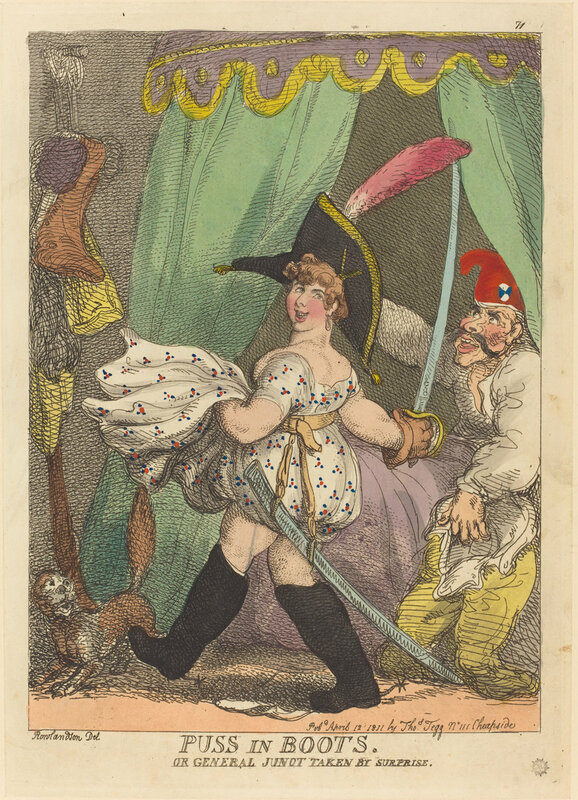 As is expected of Rowlandson, the latter are delightfully absurd. I personally like ‘Letters for Post’. 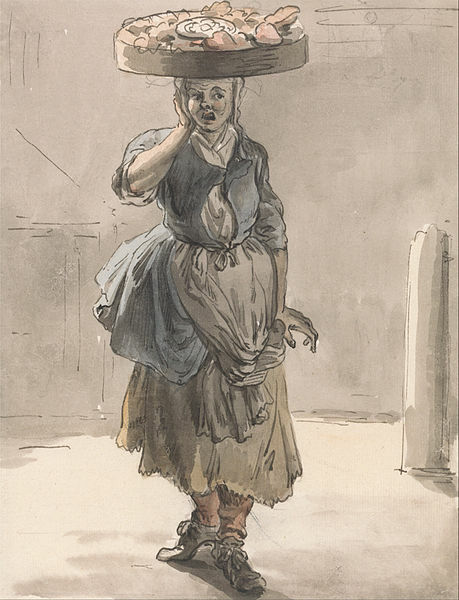 A Girl with a Basket on Her Head, “Lights for the Cats, Liver for the Dogs” by Paul Sandby (1759) — Doesn’t she look like she’s having tooth pain? I vote “most realistic”. 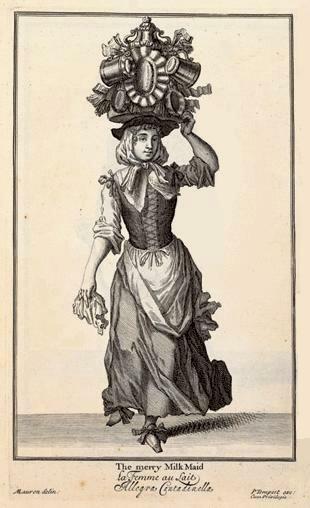 The Merry Milk Maid by Marcellus Laroon (1688) — aka, the miss who has mastered the fine art of balance. If you guys are interested in learning more, check out Old London Street Cries and the Cries of To-Day from 1885. It’s loaded with pictures and all the cries you would ever want to learn. “Such precious manners and such indecency,” scowl the English. Displayed here is the perennial contentiousness of French vs English through the eyes of satirist Thomas Rowlandson in 1792. What’s being poked at in this engraving? Fashionable deshabille. 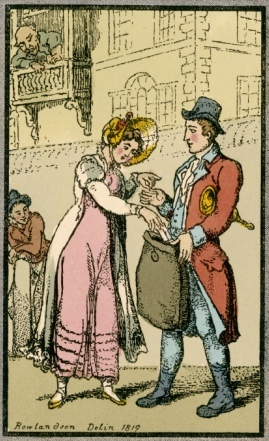 The central man is without his breeches, the lady wears a scandalously clingy and popular Chemise a la Reine, and the child below the fiddler is inspecting the curiosities beneath its nightshirt. Beyond the hired musicians, the most fully dressed figure is a dog. One of them wears not only a dress but a hat, and has feigned a delicate paw. The flaw, however, can been seen in the impudently raised tail, peeping out the too short vestment. Can you readers spot any other bits an actual French family might find objectionable? Do tell! 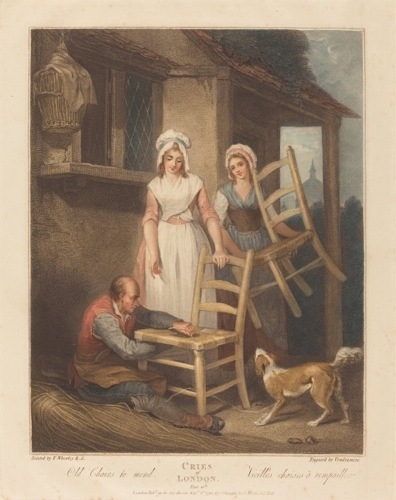 To the delight of his most astute observers, Rowlandson loved to sneak in telling details.